The Officially Licensed Touring Commemorative of the 1969 Woodstock Music & Arts Festival Announces Website Launch and Warner Home Video & Rhino tie-ins! In all, eleven original Woodstock performers from the most important event in rock music history have joined together to tour the world in celebration of and tribute to “The Original Three Days of Peace & Music” that occurred at Yasgur’s Farm in Bethel, NY in August 1969. Under license from Woodstock Ventures LC, “HOW” will perform 40 U.S. dates around the world. 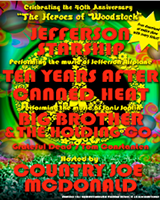 Jefferson Starship will perform Jefferson Airplane’s set & more, Canned Heat, Ten Years After and Grateful Dead alumnus Tom Constanten will perform, Big Brother & The Holding Co. will perform Janis Joplin’s set and Country Joe McDonald will perform and host – as they did Aug. 15 & 16, 40 years ago in Bethel, NY … and shall again … at the actual 40th Anniversary – on ‘hallowed’ ground at Bethel Woods Center For The Arts this Aug. 15. Quicksilver Messenger Service, “Heroes” from The Summer of Love and other special guests including original Woodstock 1969 performers John Sebastian, Melanie and Edgar Winter shall also appear on select dates. The tour pays further homage to the original Woodstock festival as every ticket purchaser shall be given the free soundboard download of the performance they actually attend. “This is the first major tour in rock history to give the music away for free in this manner,” cites tour co-producer and Jefferson Starship manager Michael Gaiman. “The positive reaction from promoters and fans to the ‘download perk’ has been huge,” adds tour co-producer and Big Brother & The Holding Co. manager Tim Murphy. “Woodstock changed the world,” said tour co-producer and Canned Heat and Ten Years After agent/ manager Skip Taylor, who was there in 1969. “It brought the ethics of the counter-culture to national prominence,” concludes Murphy. Taylor adds: “That spirit is still pervasive. Both Warner Home Video (releasing ‘Woodstock: 3 Days of Peace & Music Directors Cut 40th Anniversary Ultimate Collectors’ Edition” on Blu-Ray & DVD) & Rhino Entertainment (releasing “Woodstock: Music From The Original Soundtrack & More” and “Woodstock Two”) have thrown their support behind us with promotional tie-ins.” With strong advance ticket sales, the “HOW” website launch, the aforementioned releases & the Ang Lee film, excitement and press interest is already building to a groundswell. As far as original Woodstock 1969 performers go, this is chock full of them. Country Joe McDonald will headline the cross-country Heroes of Woodstock tour. It will feature other original Woodstock bands such as Levon Helm Band, Canned Heat, Jefferson Starship, Melanie, Ten Years After, The Grateful Dead’s Tom Constanten, and Big Brother and the Holding Company. Richie Havens is also expected to perform at noon on August 14, at the Bethel Woods Center For The Arts. The tour begins in June in Del Mar, CA and will hit locations across the U.S. Bethel, NY location has recently been confirmed and it will take place at the Bethel Woods Center For The Arts. The concert aims to celebrate what made Woodstock 1969 a historic event in the history of music. The ‘family friendly’ tour will also feature historic displays, hippie era vending, and booths for environmental and social activist groups.